Nikon D5500 camera was announced back on Jan 2015 and Nikon D7200 March 2015. Nikon finally discontinued the Nikon D5500 camera and the Nikon D7200 camera. So, literally their clearing up the stock lines to make a space for the new versions. And if you look at the scheduled announcement dates of Nikon mid range DSLR camera then the next announcement should be done by Nikon in the beginning of 2019. That’s Nikon D5700 camera is coming in 2019. Nikon D5600 vs Nikon D5500 specification comparison review is really a hard task for us and you will also feel the same when you will look at the specification comparison table of the camera. The word Identical twins is too perfect and we should say it both DSLRs core specification are mirror image of each other. As far as I remember few good rumor sources stated in the past that Nikon D5600 is coming with the same sensor as of Nikon D7200 and that will result increase in dynamic range of the camera compared to its predecessor. So, we have to wait till the DXO lab test out the new D5600 camera. Yes there are some advantages as we have mentioned in green tabs. The Nikon D5600 features 3.2″ fully articulated LCD which is better then the Swivel display unit and snapbridge connectivity support, but none of these things will help you to improve image quality. Nikon D3400 vs Nikon D5500 – take a look ahead quick comparison between Nikon D3400 and Nikon D3500 camera, both the camera features excellent Core specification but the Nikon D5500 is a mid range DSLR camera whereas Nikon D3400 entry level DSLR camera. Although the Nikon Mid range D5500 is also waiting for an upgrade and its successor is expected to arrive in the first half of 2017, but before that we have to look at the specification comparison between entry level and mid range DSLR. The sensor of the both the camera is almost identical, we have same resolution, ISO range and even the image processor of the camera is also same. Hence we don’t expect a major difference between the image quality of both the camera. Advance AF system inside the Nikon D5500 camera – Being a mid-range DSLR the Nikon D5500 camera features advance AD module inside it, the Phase detect AF sensor of the Nikon D5500 camera carries 39 point AF system, whereas the Phase AF module of the Nikon D3400 camera carry 11 point AF only. Hence the Nikon D5500 camera is undoubtedly better compared to Nikon D3400. The Nikon D5500 will covers more area of the screen under AF, that will also help you to grab moving subject in no time. The rest of the core specification of both the camera is almost same, the display, continuous shooting speed and video modes are almost same. Battery Life: WOW, Nikon new battery allows user to grab 1200 shots on a single recharge, which is 2X more than Nikon D5500 DSLR. Light weight: The Nikon D3400 camera is light-weight compared to Nikon D5500 DSLR. Price difference: Nikon D3400 available at $646 and Nikon D5500 available at $846, you have to pay $200+ to buy Nikon D5500 camera. Conclusion: Nikon D3400 and Nikon D5500 camera will give you almost same image quality, so we recommend you to get Nikon D3400 camera, But if you are a sports shooter and want a camera with advance AF system we recommend you to get Nikon D5500. Sensors:- Both camera features sensor made by Sony however both of them built over different technological background, the Sony uses SLT technology. The camera built with a uses a fixed translucent mirror inside and Nikon D5500 is a DSLR that moves its mirror up every time when shutter is clicked. As you can see the image the SLT A68 mirror is fixed so the mirror will absorb 10 of light that will sure effect the image quality of the SLT. Both the cameras Sony A68 and Nikon D5500 have almost the same resolutions of 24MP. Sony A68 has CMOS sensor along with the advanced Bionz X image processor; works together to produce high resolution images with better color combination in various situations .While Nikon D5500 works with the EXPEED 4 processor and APS-C CMOS Sensor to produce the images with high quality. Sony A68 will perform well in low-light conditions with more accuracy along with the reduction in noise compare to Nikon D5500. Also the sensors of both the cameras are designed in such a way that there will be no need of optical low-pass filter and hence the sensor is sufficient to acquire more detailed subjects along with sharpness. The difference in technologies of both the image processor of the cameras will definitely affect the image quality as well as processing speed of the cameras. AF System:- Sony A68 has 79 points AF System which includes 15 Cross-type AF , which shows quick response in the acquisition of desired subject in different range of lighting conditions while Nikon D 5500 has 39 points AF System including 9 cross type AF points , shows its low performance compare to Sony A68 due to less AF points. Here, the inclusion of 15 Cross-type AF Points makes Sony A68 more superior compare to Nikon D 5500. So due to the more AF points, the Sony A68 deserves to grab more AF area of the screen and also the camera finds out and focus real subject instead of something else compare to Nikon D5500. Image Stabilization:- Sony A68 has built-in image stabilization which helps to minimize the camera shake during shooting. It also reduces the unwanted hand shake during hand-held shooting along with various type of camera shake, and hence come back with better and impressive images during photography. While such feature is not present in Nikon D5500, so the users don’t any option to get impressive images with-out hand shake but they have totally rely on camera lenses they are using. ISO:- Both the cameras have similar ISO of 100-25600. Hence the similar ISO supports both the cameras to capture the magnificent images even in low-light conditions with increased dynamic range. Continuous Shooting Speed:- Sony A68 has continuous shooting speed of 8fps while Nikon D5500 has 5fps. Videos:- Sony A68 as well as Nikon D 5500 capture Full HD video Hence both will give similar result and will definitely satisfy the users with impressive and better images. Verdict: Sony A68 is recommended for sports shooter that gives you advance AF system and fast continuous shooting speed on the other hand Nikon D5500 will give you better image quality with more dynamic range. 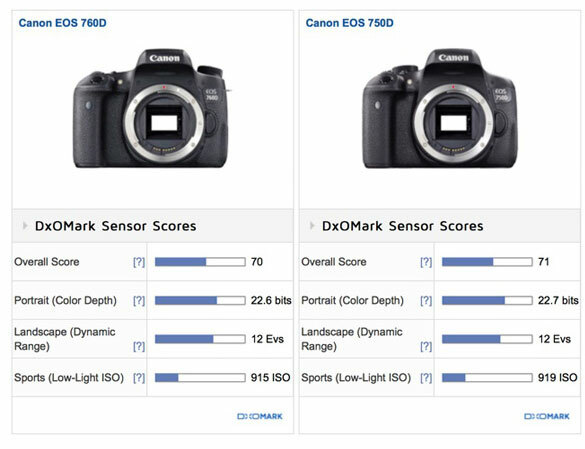 DxOmark finally tested both the recently announced camera by Canon, the camera sensor perform better compared its predecessor, however the sensor score of Canon 750D/760D is still lower than of Nikon D5400 and Sony A6000. 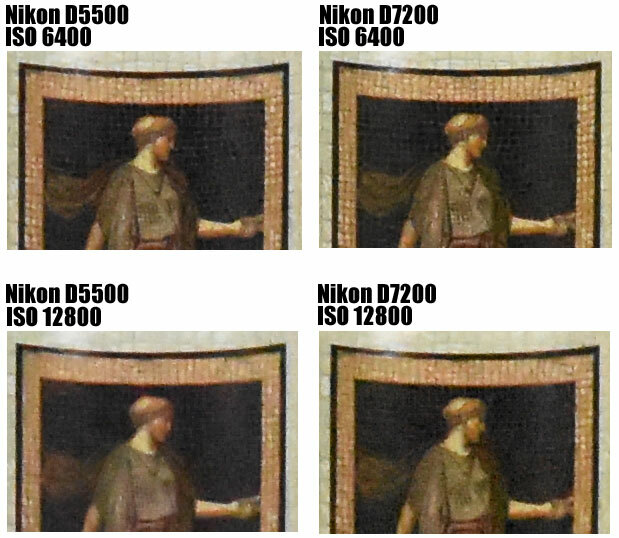 We are not able to recognize any major difference in the image quality of between Nikon D5500 and Nikon D7200, however at ISO 6400 Nikon D7200 grabbing bit more details compared to Nikon D5500, so if you don’t need advance AF system.. don’t put your extra money on the Nikon D7200 camera. 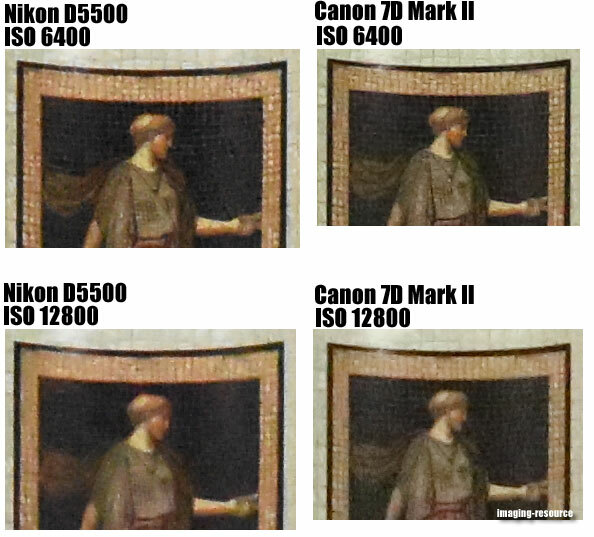 As we know that Nikon D5500 is a mid entry level camera and 7D Mark II is a high end APS-C camera, By closely examining both the samples we can clearly see that Canon 7D Mark II showing bit more details in the image, compared to D5500 at both ISO range.